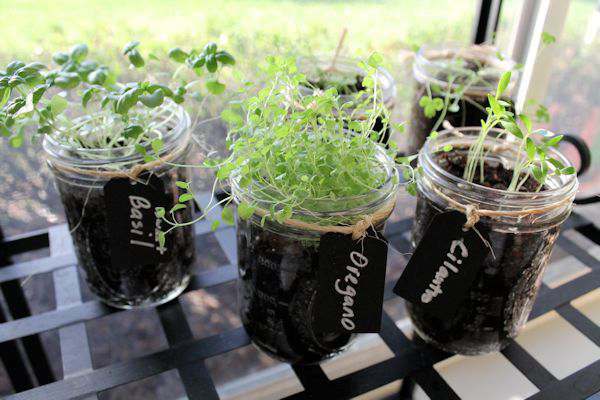 Growing herbs so so easy in Mason Jars and look so cute in the window of your kitchen. They also make great gifts. I love cooking with fresh herbs but just don’t have space in my small garden and want them at easy access. I also like a bit of convenience in my old age, so, what is a girl to do?? 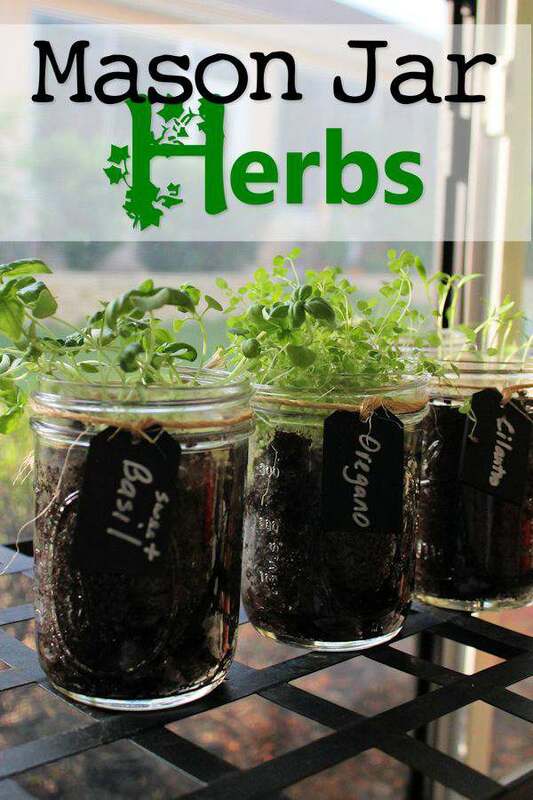 Grow Mason Jar Herbs in the house! 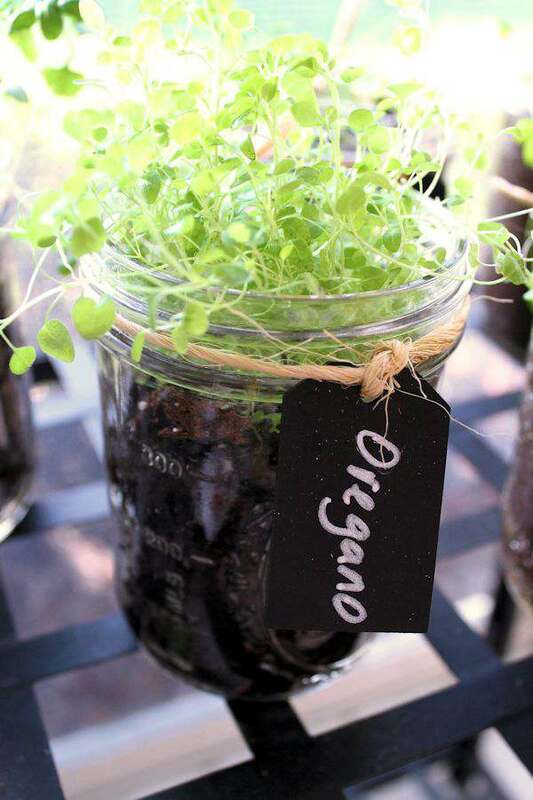 I love mason jars and I love the idea of growing herbs in them. I have the perfect sunny spot for them and its right next to my kitchen! All you need is herb seeds, potting soil, mason jars and in my case, I had to make it pretty and oh so country. So I grabbed some Chalkboard Tags , my trusty Chalk Marker and twine from the garage. Either buy your herb seeds or use the ones you harvest. I prefer to buy them when they go on sale which makes them a few cents per packet. They are pretty dependable on sprouting easily. 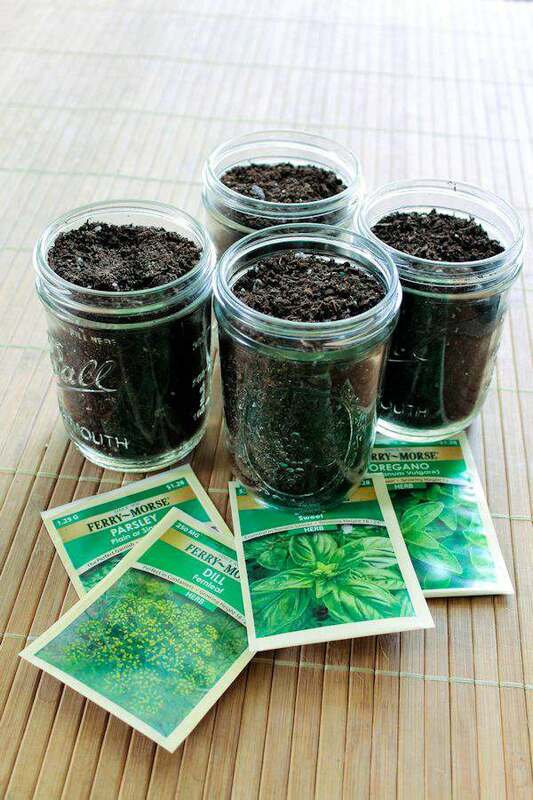 Just fill the mason jars with dirt, add the seeds and then attach your tags. 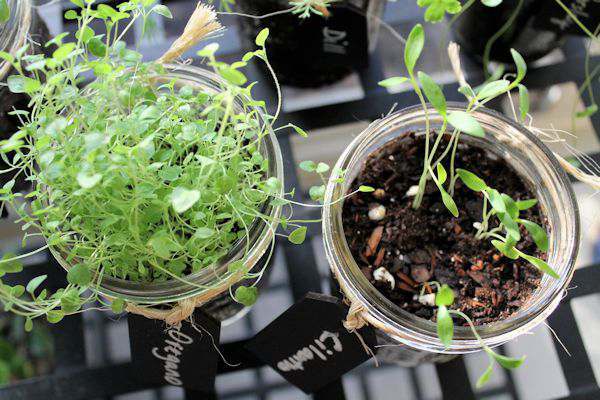 I found out the first time I did this project, that I only need a very “few” oregano seeds (they are about the size of salt) because they really love to sprout (plant on the left in the picture below) and you could end up with too much in your jar. Be sparing with those or you will end up with a Chi Chia Mason Jar. I use a plastic hand mist sprayer to spray the seeds every day until they have sprouted well and then I will water sparingly after that. 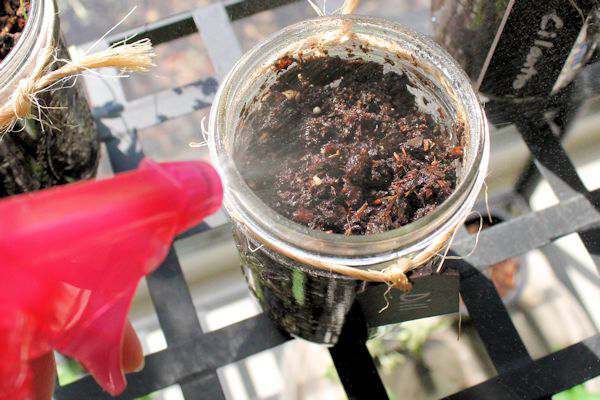 Since there are no holes in the bottom for the water to run through, don’t over water or your plants will rot. You can use a glass drill bit and drill holes in the bottom if you like. But again, I’m lazy. 😉 You can also put small rocks in the bottom of the jar for the extra water to go. The tags are super easy to make. Write the name of your herb and tie it to the jar. So cute! And wouldn’t these make a great “Welcome to the Neighborhood” gift or to a teacher who loves to cook! I will get a pretty good crop out of the jars and when I’ve used them all up, I just start the process all over. They usually last about a year in the jars. I have also started the herbs in the jars and then later transplanted them to larger pots outside. Oregano can be very invasive and will drop their seeds everywhere, so if you plant it in the ground, put it somewhere you don’t care if it runs. A great project to do with the kids this summer on a rainy day when they can’t go outside to play. You could also do this in the smaller jars with the kids which would be easier for them to handle and carry. A great way to teach them about growing plants we eat. That’s great! Thanks for sharing and thanks for linking up with us! What a clever idea for an herb garden. Very creative. I love mason jars. 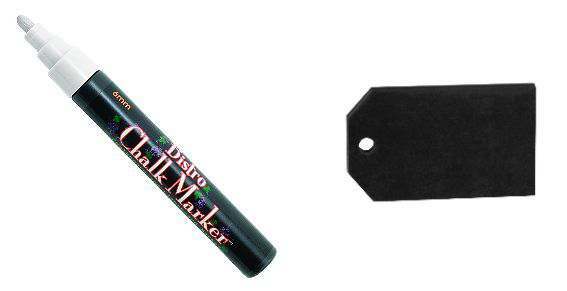 I have even seen them used at weddings! Hi Tammy! I was just thinking about planting some indoor herbs so this post is perfect!! I love your idea of using a mason jar, too!! I LOVE mason jars! Thanks for stopping by my blog and leaving a sweet comment! You have a new follower! Have a blessed weekend! I hope you enjoy growing them in mason jars and thanks for stopping by. I love how you used jars for this project! And that’s funny about the oregano seeds being so fertile. Haha! I’ll have to try this out! I saw your link over at Link’n Blogs. I have another batch of them growing and the jar is covered with now seedlings. Thanks for stopping by. Love this. I’m going to do this next month and hang them in the window. LOVE THIS!! Thanks so much for linking up at the Pintastic Pinteresting Party!! I was just thinking about the water. Maybe you could put some small gravel rocks in the bottom that way the water wouldn’t stay in the dirt. But the water bottle spritzer is a good idea also. This would make great teacher gifts. Thank you for that suggestion Candi and I think that would work great also. I need to go into my post and put your suggestion there. Thanks again for stopping by.